They are perhaps more recognizable among children as the funny-looking characters that adorn their daily multivitamin, but today "The "Flintstones" are 50! At first we thought, “How can a family that lived circa 1,000,000 B.C. be just 50?” But then we remembered it was a fictional cartoon. Hanna-Barbera’s "Flintstones" TV series premiered on ABC on September 30, 1960, and was among the first of a new brand of television series – the hybrid that worked on both child and adult levels. "The Flintstones" centered on a working-class couple “from the town of Bedrock," Fred and Wilma, who lived next door to their best friends, Barney and Betty Rubble. Fred and Barney worked together at the quarry for their boss, Mr. Slate, and when their wives weren’t dragging them to the opera, they enjoyed bowling and meetings at the Water Buffalo Club. Bedrock also saw its share of garden-variety wacky neighbors of varying eccentricities and had a revolving door of celebrity visitors. It was practically the Aspen of its day. Of course, the stars had names like Cary Granite and Stony Curtis. Fred and Wilma were the first couple ever to be seen on television sharing a bed, according to the U.K.'s Telegraph, which has compiled a list of the 15 things you may not know about the cartoon. The show was even co-sponsored by Winston cigarettes at one point, with Fred and Barney appearing in commercials advertising for the company, the Telegraph points out. Google has marked the day with a "Flintstones"-themed Google doodle tribute. How will you celebrate? When the sundial indicates it’s time to slide down the dinosaur’s tail, we’re going to head home and get ready to watch CNN’s Anderstone Cooper 0° (you know, because the world was flat and there was no 360° to speak of). Fred and Barney didn't work together! the neighbour was Creepella. Still loving this show. i love the one with the new neighbor whose dog had puppies with dino, Fred as the frog mouth. How about Fred and Barney built a swimming pool and then had a falling out. I still sing the Aniversary song from the 88 fingers. How about when Fred was very suave as Frederico. Classics. Betty was hot, no doubt about it Bob. But, this image is hotter! I love it, my fnierd, perfect composition and TONS of great details to keep the viewer captivated. I love the trucks off to the right in the distance there just one of those details that creates so much drama and interest. Top drawer! What about Superstone?? Beee heeee heeee haaa haaa! The Flintstones is the official cartoon of the Creation Museum in northern Kentucky (not Cincinnati). Maybe their parents never told them it was just a cartoon. Gruesome & Creepela moved in next door...!! The Simpsons owe everything they have to the Flintstones. Say, what ever happened to the Great Kazoo..? Don't forget the Cartrocks from the Rockerosa! 88 Fingers Louie..."Happy Anniversary, Happy Anniversary, HAAAAAppay Anniversary!....Kazu (sp? ), I forget the names of the family that moved in next door, kinda like the Adam's Family....maybe the Creeps? Best cartoon ever, gonna go buy the DVD's for my young boys! The episode where Fred and Barney get the "race car" is my fav. Fred has to race under an alias....Goggles Pizano! Hilarious. The Flintstones are like comfort food.. warm memories of coming home after school and watching them on TV, starting every morning with a Flinstones vitamin and drinking choclate milk out of a 'Pebbles' cup. Fred and Barney get glued to a bowling ball. Barney gets hypnotized by the great mezmo and thinks hes a dog. 88 fingers sells fred a hot piano. Fred & Barney were on the down low. Watched when I was 2 and still watching at 48. Best cartoon ever! I USED TO WORRY ABOUT FRED WHEN HE GOT LOCKED OUT AT THE END OF THE SHOW....DUH !!! I'm pretty sure that Ozzie & Harriet Nelson (The Adventures of Ozzie & Harriet) were the first couple shown in bed together on TV. That was in the late 1950's, and as they were married in real life, the censors were OK with that. I think you forgot to celebrate the debut of Yogi Bear 1 or 2 years earlier. I remember watching "The Flintstones" with my sister when we were home with chicken pox. You can tell that the moron who wrote this article did no research and was never a watcher of the show. Here a some corrections to this poorly written and often erroneous article: 1 – Barney never worked at the gravel pit for Mr. Slate. His occupation was never defined but he and Fred were never co workers. 2 – It was called The Water Buffalo Lodge or The Loyal Order of Buffalos, never "The Buffalo Club." Why CNN is asking to be disrespected by publishing silly and inaccurate articles is a mystery. The writer should not be fired because she is only a 20-something with limited knowlege. But her editor should be. Right you are. And "The Flintstones avoided being affected by the Children's Television Act by being labeled "having historical value". What? Even during the 60's, everyone should have know that man and dinosaurs didn't coexist. Yes it was a make-believe set up, but to get a pass for basically being historically inaccurate is a joke. This loophole wasn't discovered until the late 80's. Very weak article – all fluff. I do remember Pebbles playing with giant Legos which were a toy sold at the time – talk about product placement. And there is a copy of the Winston ad out there in e-land with Fred and Barney. Gazoo appears in Family Guy, along with a background sight gag in another episode, a nice tribute. As is the Simpsons, with Homer singing a parody. I found it fascinating when I was a kid to see Barney and Betty adopt a child in Bam-Bam – he was the first adopted kid I ever heard of. Then they added the great Kazoo, and it all went down hill from there. Did youi ever wonder how the creators of the Flintstones got away with having a Christmas special when they took place 1 million years before the birth of Christ. I'm not religous at all, it's just a major hole to fill. Yes, it was a cartoon, but how much can you suspend disbelief ? Terrific voice talent and decent writing but horrible animation. I barely remember it in prime time, devoured every episode in syndication, but was shocked at the poor animation and overall visual production values when seeing it recently on DVD. To set the record straight, the Flintstones was based on The Honeymooners, with Jackie Gleason, a popular show of the time and was the brainchild of my Dad, John H Mitchell, of Screen Gems. Joe Barbera and Bill Hanna were a great team, also animating Yogi Bear, the Jetsons etc. Yeah, and Gleason was so upset, he threatened to sue. Fortunately, he never follow through with the threat. I remember that night in 1960. First, my dad took our family to dinner at this brand new drive-in called . . . McDonalds! Then we hurried home to watch this brand new show called . . . the Flintstones. Sigh . . . what a night! The Martian's name was The Great Gazoo, voiced by Harvey Korman. Mary Kay & Johnny was the first show to show a couple sharing a bed, back in 1947 on the DuMont network. Mary Kay & Johnny only showed that the couple had a single bed. They were never seen in bed together. It was only assumed that they slept in the same bed. Fred and Wilma were the first couple to actually be shown in the same bed together. It was Madame Yes, not Madame X, who said, "I'm too important to be captured." The space-man was The Great Gazoo! And who can forget the great Ann-Margrock? One of the best shows ever. Where is the time going? What the heck was the little space-man's name? I loved the episodes with him!!!!! I was wondering why their picture was on the Google search page today, now I know. Happy Anniversary to the Flintstones and Rubbles. Hate to admit I am that old, but I remember watching the Flintstones when I was a kid. It was intended as prime time show for adults and was sponsored by Winston cigarettes. I still remember Barney an Fred dancing around smoking tobacco and extolling Winston's virtues. I watched a full episode for the first time in several years. If a man acted like Fred today, with the screaming at his wife and buddy, he would be considered abusive. I love the episode that crossed over to Bewitched! Samantha and Darren move in next door to Fred and Wilma and the fun begins! Two popular shows in one! Animated kid's shows today are unoriginal and poorly written. I turn 50 next month, too. It does not seem that long ago we were watching this every week and endlessly in syndication. Wait a minute ... Barney didn't work at the quarry...but did visit from time to time. Barney had a top-secret job that was never detailed. Right you are. The writer of this article isn't very Flintstones savvy. btw, probably the worst episode of the Flintstones was when they discovered Pebbles and Bam Bam could sing. That obnoxious song "Let The Sunshine In" was actually a Top Ten hit back then. And you thought "It's A Small World" was annoying!?! The Flintstones were sponsered the 1st year by Winston, but it wasnt a kids show then, inspired by the Honeymooners, it was and still is one ofthe greatest shows ever on TV, Tony Curtis, who just passed away wa a guest, as were so many others, I remember if you could gues the babys name you and the family won t trip around the world! John Goodman made a good Fred Flintstone too!! Best cartoon I remembered watching when I was a kid. It was my favorite. Flintstones, the Jetsons, scooby doo, speed racer were my favorites. I believe Flintstones and Jetson were produced by Hanna Barbara. Flintstones, I was told back in the day was a spin off of the Honeymooners with Ralph Cramden and Ed Norton. I can see the similarities but not sure. The Flintstones was the great cartoon ever produced! Yes, the Flinstones, Jetsons and Scooby Doo were all Hanna-Barbera cartoons, along with Yogi Bear and several others. The shows were already in syndication during my childhood in the 1970's. They were silly, but for their time ground-breaking, and certainly have become a part of 20th Century Americana. Sorry there Capt. Mark but Art Carney was never the voice of Barney. According to reliable sources, Mel Blanc was the principal voice of Barney Rubble, although Daws Butler (who previously voiced Ned Morton, a mouse version of Ed Norton (the inspiration for Barney Rubble), in the Looney Tunes short The Honey-Mousers) briefly assumed the role while Blanc recovered from a car wreck. Since Blanc's death, Frank Welker, Jeff Bergman, Stephen Stanton, Seth MacFarlane, Kevin Michael Richardson and Scott Innes have all performed the role. Did a big slab of ribs tip your car over dom? Maybe you have a Dinopeptic ulcer? There must be something causing you to click on links to stories you don't care about. If you are just commenting for the thrill of seeing your own nickname, pick something more fun! who doesn't know them?! everyone does? VIVA ROCK VEGAS! 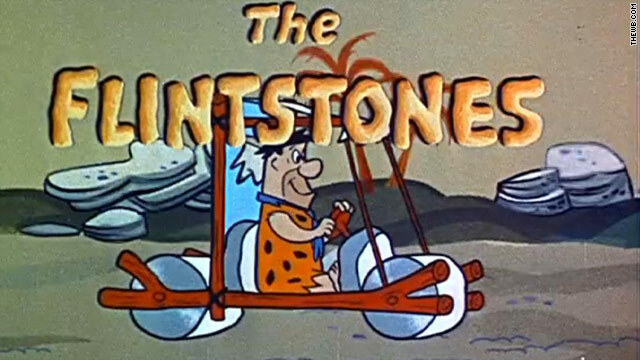 I like to call the beltway around Washington, DC the Fred Flintstone Parkway becuase many drivers on that road drive the same way Fred used to drive on the freeway. Figured that one out all by yourself? That formula has been used over and over again because it works. The Flintstones was actually a take-off of the Jackie Gleason Show – Fred was Ralph Kramden, Barney was Ed Norton – nothing really new – just put into cartoon format. I have not seen the original Flinstones but youtube is a wonderful way for us to reconect with the funny family from the stone age. As a proud 90's child I can say watching Flinstones on Cartoon Network was a Saturday Morning experiance that was as awaited as watching Pokemon. Remember this song....... There's a town I know where the twisters go called BEDROCK!!! Twist Twist!!! Slight correction.... it's not 'Twist', it's 'Twitch'. I absolutely do! That was a great episode...didn't know Fred and the crew could jam like that! I CAN'T BELIEVE THT "THE FLINSTONES" ARE 50!!! MY MOM REMEMBERS THE DAY THEY FIRST CAME ON TELEVISION IN BLACK AND WHITE. thn again i am 16 years old.... or am i??? when i was little i wasnt a huge fan of the Flinstones, but if i would have known the crap for cartoons that there is now, TRUST me, i would have watched more epesodes. sigh.. what is the world coming to? The Flinstones live on in our house. We have all 6 seasons on DVD and my son puts them on at least every night! We love the Flinstones – especially Shangri-La-Di-Da-Da! And don't forget, this "childrens' show was sponsored by Winston cigarettes! This "childrens show" was geared for grown-ups and was shown at prime time which, back then, started at 7:30 pm. unknown wrote an interesting post today onAre You Putting the Brakes on Your Business? Virtual Assistance Here's a quick xreecptAnswer: Well, we have a website. Anyway, I think it’s still there. 2. Are you marketing on the Internet or via e-mail? Answer: What do you mean, how do you market on the Internet? 3. Do you have a business blog? I still have my Flintstone's game board with plastic log cars, palm trees and all the main characters including Dino. Guess I will never grow up. I had a Pebbles doll, too. Thanks Mom & Dad ! keep the flintstones in your life. May I ask how old is the big child today? Flintstones toys. 54 years old with a mind of a 5 year old. I never had a Pebbles Flintstone doll, but my friend did. She was very cute, with the bone in her top-of-her-head pony tail and her animal print dress. The Cartoons today are horrible, the Flintstones usually had a good message, it was funny and FRED was the BEST! WIILLLLLLLLLLLLMAAAAA! Eating a huge steak is considered "Flintsone" sized. Yabba Dabba DOOOOOOO!!!!! And don't forget James Darren as James Darrock! Well, I remember watching "The Flinstones" in black and white television as a kid back in the 1960s. And who can forget that "yabadaba doo" from Fred? And Dino? Eventually he got "tacky" and insipid after Pebbles came along. But is one cartoon show we shall never forget. "WILMA!". The story fails to mention it was the first primetime cartoon. This was best animated show ever created!!!!!!! A great show to be sure!!! I'll celbrate by hitting my wife in the head with a rock! !